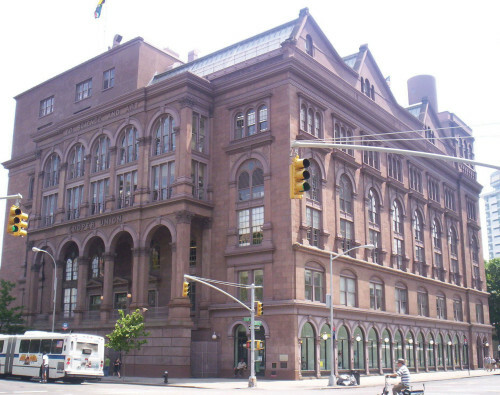 The Cooper Union was founded in 1859 to provide free higher education to students based solely on merit. The school’s founder, inventor Peter Cooper (1791–1883), used his considerable wealth to set up the institute. A beautifully executed monument to him by Augustus Saint-Gaudens (1848–1907) can be found near the East 7th Street entrance. On February 27, 1860, Abraham Lincoln appeared at the Cooper Union to deliver a speech in the Great Hall in the basement of the main building. The hall held 1,500 people and was selected because it was one of the largest auditoriums in the city at the time. It remains today much as it was in 1860 when Lincoln spoke there. More than anything else, Lincoln’s speech led to his nomination for the presidency. “Let us have faith that right makes might,” Lincoln said that evening. The newspaper editor Horace Greeley said the speech was the most convincing argument to restrict the extension of slavery he had ever heard. Because of the press coverage, the little-known Lincoln awoke the next morning to find himself a famous man and the front runner for the Republican nomination. “This is a government of white men and established exclusively for the white race,” said then-Congressman Fernando Wood. The Women’s Central Association of Relief was organized at the Cooper Union. 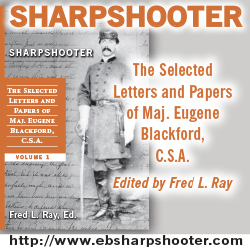 Out of this group sprang the U.S. Sanitary Commission that provided medical help, supplies, clothing, and food for the troops during the Civil War. The Ladies Committee met every day and opened a storefront on the Third Avenue side of the building to help support these efforts financially. Thanks for this post, Bill Morgan, and A Civil War Blog for providing a platform to continue this discussion. 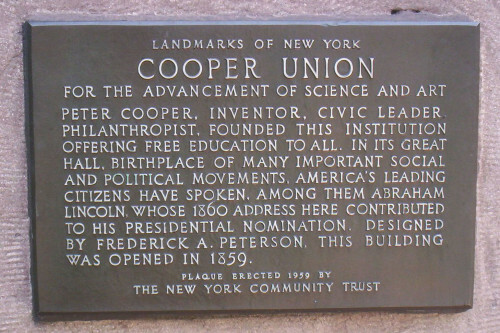 I think a lot of casual Civil War readers may not be aware of the significance of Cooper Union in New York City. 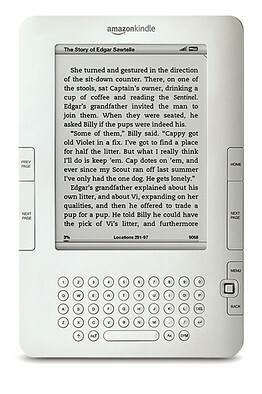 Your post provides insight into this location, which is enjoyable for both avid readers of Civil War material and newcomers to the topic. We look forward to seeing the upcoming posts in the following weeks.